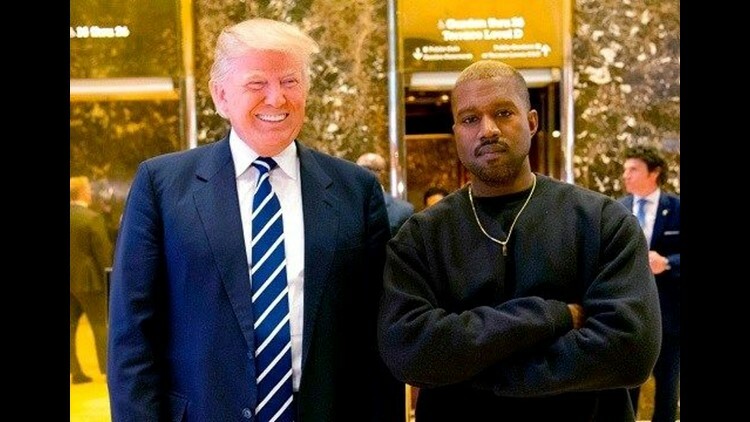 President Donald Trump praised Kanye West on Thursday for having "good taste" for supporting the president. WASHINGTON (AP) — President Donald Trump praised Kanye West on Thursday for having "good taste" for supporting the president. Trump said in an interview with "Fox & Friends" that he knew the rapper "a little bit" and always got along with him, and said that West has noticed the low unemployment rate for black Americans. "He sees that stuff and he's smart and he says, 'you know what, Trump is doing a much better job than the Democrats did,'" the president said. In a tweet on Thursday, West wrote that while hate is a similar emotion to love, "hate is not the answer." He also tweeted a link to a TMZ.com story about himself with a headline that described West as "the opposite of erratic." The story noted that West is releasing a new album in the coming months. West has toyed with running for president himself and on Wednesday tweeted a poster of his face emblazoned with the slogan "Keep America Great" and "#Kanye2024." He has recorded several best-selling albums and produced a buzzy fashion line and has the undeniable talent for attracting attention. He's also been linked to several previous presidents, including when Obama called him "a jackass" in 2009 for storming the stage at an MTV awards show to interrupt Taylor Swift. And in 2005, during a telethon to raise money for the victims of Hurricane Katrina, West criticized the White House's response to the storm by famously charging that "George W. Bush doesn't care about black people."